I am often asked this question, and it really got me thinking. As a trainer and instructor I like to incorporate both floor and standing abs exercises into my workouts, classes and videos. I don’t always just focus on an “abs only” move either — we can work our abdominals during so many exercises that aren’t just for the abs (like during a 1-arm overhead press for example), and if there is a way to get more done in less time, I’m always up for it! It’s also important to note that some individuals may find that certain abs-specific exercises cause more pain than benefit, especially if there is neck or back strain involved, and in those instances, more specific standing work might be more appropriate. But those are all just my opinions however, based on my experience in the fitness industry (where research is always evolving and changing the methods we use to work out and train), so I wondered — is there any research that has studied the effectiveness of both, and compared the two? Apparently there is! And of course, one of my favorite experts, Michele Olson, PhD. (also known as the “Exercise Doctor”), professor of exercise science at the Auburn University Montgomery, has studied abs training and had some great answers to share about this topic. Read on to find out what she had to say about the best way to work your abs for the greatest results. 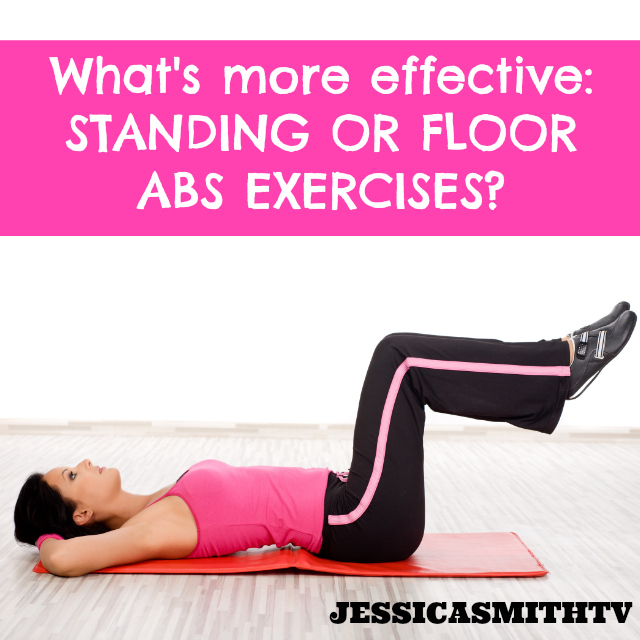 When it comes to training the abdominals most effectively, should you do standing or floor abs exercises, or both? Why? “Both!” Olson says. When it comes to great abs moves, it all comes down to gravity. “The muscles of the abdominal wall respond with the greatest intensity when you lay face up, face down or sideways to gravity,” she explains. It’s in these ‘floor based’ positions that your abdominal muscles have to work to pull the weight of your trunk away from the downward pull of gravity (something Olson’s published EMG testing shows). And, Olson says, when performing standing crunches, twists or side bends, your abdominal muscles are parallel to gravity, where they don’t fire as strongly but your back muscles do more work, which is essential. “It’s important for your back and ab muscles to work together effectively in real-life positions like sitting and standing,” she notes. Have any studies noted one type of training to be more effective and should we focus on one type of movement over the other? Research shows that floor exercises do produce greater activation of the abdominal muscles (as noted above), and a few of Olson’s favorites are the Pilates Hundred, Double Leg Stretch and Single Leg Stretch. “My studies also show that these moves cause the deepest, stabilizing abs (the transverse abdominis) to fire well,” Olson says. So does that mean you should skip the standing abs work? Definitely not! “Floor and standing work can compliment one another,” she says. “During standing, the abs fire moderately but other parts of the core get involved like the lats and the back muscles.” Just a word of caution, Olson notes, for all abdominal exercises – whether standing or on the floor, be sure to do them using a controlled speed and moderate repetitions to avoid excessive wear and tear on the spine. Tell us, what’s your favorite abs exercise and why? Share it with us in the comments below! I personally prefer standing abs workouts, but I’ve noticed that indeed, I feel more challenged (and sore later) after floor exercises…so I try to incorporate them, and grin and bear it! Thanks for the article Jessica. Better when I do that regularly! I always prefer standing abs routine and standing workouts. I’d work out on the floor only, if I could, and I’m totally addicted to abwork, because I’m comfortable with it, I love it, I find it relaxing and rewarding. I like crunches, reverse crunches, obliques, lower abs, planks, side planks, you name it. I think I belong to an absolute minority. On the other hand, standing abs are great, too, because you engage the whole core and all standing exercises involve the use of your core muscles. Standing abs are great for balance, too, so they are an absolute must, but for me me, thay are way more challenging than floor abs. I love doing standing abs workout, because it’s more convenient. And you don’t need a mat. Doing it on the floor is more challenging. But of course, I do them both. Thanks Jessica for always sharing inspirational quotes and educational information. I have mild scoliosis, so have had problems with lower back strain, and floor work sometimes aggravates that. I’ve also noticed that sometimes my form is off on standing work, and I’m rounding my back, and I think that puts a strain on my back too. So, I know proper form is important too. Dr. Michele’s description of standing ab work – that it works the back muscles along with the abs – might explain why it’s better for my back. Since I’ve been doing your workouts, I have noticed improved posture, along with a stronger core. I’m thrilled about that, as it makes my scoliosis less noticeable. My favorite ab exercise would be the plank, as it seems to use most of the muscles of the body. GREAT explanation! Sounds like what I learned in PE, a well rounded and balanced program is best, which is why I keep coming back for more @ JessicaSmithTV.com!!! You can always count on Jessica for a well rounded workout and tons of common sense, as well as “I’m right here with you”, which I respect and appreciate. Thanks Jessica for tackling this topic!